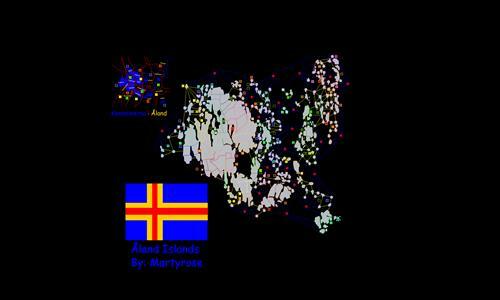 As everyone knows Åland is the most åwesome group of Islands in the world, that's why there is now a map of it! It is part of Finland but the major language spoken there is Swedish. This is my first Real-World map. Åny suggestions are always welcome! Review by Nathan on 2/24/2015. At first, I wasn't sure what to make of this map. It is obviously intricate and extremely detailed. I also like that it has nearly 300 territories. Still, something bothered me. I realized, probably much later than I should have, the inherent advantage granted to players starting on Fasta Aland (the main island). There are so many more connections to adjacent territories on Fasta that players can expand much more quickly. Those beginning in the eastern archipelago are limited by the number of territories they can access per turn, and will be quickly left behind in the race to gain income. However, I think this issue can be fairly easily dealt with simply by increasing the number of connections between the small islands. Many of the islands connect to only 2-3 other territories. Making more connections will better balance the island players' ability to expand at the beginning of the game and should make gameplay more equitable and, ultimately, enjoyable. Excellent idea, I realized that there was an advantage when picking on the main island, but I thought that the 3 Grey islands (Finländska andra Öar) would make it balanced enough, I will change it as soon as possible. Review by gui on 2/24/2015. Review by Andalorium on 12/16/2016. Love the size, and idea, it did take time to get used to the "star" connections, but it was easier to follow then the thousands of lines everywhere.